Human-companion animal interaction and well-being for humans and animals; Relocation of older adults. Dr. Johnson’s externally funded program of research merges her earlier work on promoting wellness during older adults’ life transitions with the benefits of human-companion animal interaction. 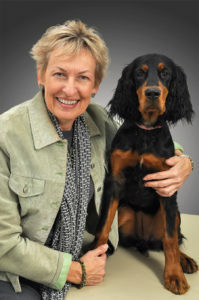 Her research shows that companion animals may provide a unique source of social support and facilitate motivation for exercise and other wellness-promoting behaviors. Most recently, her research demonstrates that human-companion animal interaction may be a powerful motivator for physical activity through dog-walking. This work has been highly successful in underserved populations such as those residing in public housing and also older adults. Presently she is conducting a two-site clinical trial testing the effects on physical activity levels and Post Traumatic Stress Disorder of pairing recently returned U.S. military veterans with shelter dogs for dog training activity, and a three-site trial of veterans who are participating in therapeutic horseback riding for stress reduction. Her NIH-funded study of abused children is testing the stress outcomes of children when they have a service dog present with them during a forensic interview. She is also partnering with the St. Louis Zoo on a study of heart rate variability in zoo visitors in response to petting stingrays in a zoo exhibit. In 2012-2013 she conducted a study of health, locus of control, and self-esteem among prison offenders who train shelter dogs. Deem, S., & Johnson, R. A. (2013). Experiencing animals in a zoo: Heart rate variability and perceptions of adults. Association of Zoos and Aquariums Conservation Endowment Fund. $21K. Johnson, R. A. (2013). Effects of equine assisted activities on PTSD symptoms, coping self-efficacy, emotion regulation, and social engagement in military veterans. Horses and Humans Foundation. $50K. Johnson, R. A. (2013). Puppies for parole: Shelter dog training and inmate behavior outcomes. Mizzou Advantage Grant. $24K. Second year funding proposal. Dog presence and children’s stress during forensic interviews for child abuse. NIH/NICHD RO3. $100K. (2011). Puppies for parole: Shelter dog training and inmate behavior outcomes. Mizzou Advantage Grant. $24K. (2011). Exploring human-companion animal interaction for families of children with autism. Mizzou Advantage Grant. $50K. (2011). The following four grants support one component of a four-part project with the same title. Mutual enrichment: Veterans training shelter dogs. MU Research Board Grant. $48K. (2010). Mutual enrichment: Veterans training shelter dogs. Waltham Foundation. $30K. (2010). Mutual enrichment: Veterans training shelter dogs. Banfield Charitable Trust. $30K. (2010). Mutual enrichment: Veterans training shelter dogs. Pedigree Foundation. $25K. (2010). Research meets practice: Human-animal interaction in obesity across the lifespan. National Institutes of Health. National Institute for Child Health and Development (NICHD 1R13HD062078-01). $10K, (2009). Caring for both ends of the leash: Effects of owners visiting their dogs hospitalized in an intensive care unit. WALTHAM™ Centre for Pet Nutrition. $18,687, (2009). Seniors fostering shelter dogs: Improving health and well-being together. International Society for Anthrozoology & WALTHAM™ Centre for Pet Nutrition. $30K, (2009). Walk a hound, lose a pound, and stay fit for older adults. The WALTHAM™ Centre for Pet Nutrition/American Association of Human-Animal Bond Veterinarians, Human-Animal Bond Research Collaboration. $19,993, (2007). “PALS for Seniors” animal assisted activity training & registration. Li’l Red Foundation. $400K, (2007). Testing a dog visit protocol with newly admitted nursing home residents. MU-Columbia Research Board Council Grant. $7,500, (2005). Non-invasive assessment of stress in dogs involved in animal assisted activity. IAMS Corporation. $25K funded in-kind support. (2004). Neuro-chemical indicators of the human animal bond. V.P.I. Skeeter Foundation. $25K, (2003). Walking for healthy hearts. Missouri Foundation for Health. $134K. (2002). Neuro-chemical indicators of the human animal bond. V.P.I. Skeeter Foundation. $100K, (2001). Animal assisted therapy and anxiety among radiation therapy patients: An MU interdisciplinary randomized clinical trial. University of Missouri Columbia Comprehensive Cancer Center Key Group Seed Funds. $50K, (2000). Zeltzman, P. & Johnson, R. A. (2011). Walk a hound, lose a pound: How you and your dog can lose weight, stay fit and have fun together. West Lafayette, IN: Purdue University Press. Johnson, R. A., Beck, A. M., & McCune, S. (2011). The health benefits of dog-walking. West Lafayette, IN: Purdue University Press. Johnson, R.A. (2017). Relocation stress syndrome. In B. Ackley, G. Ladwig (Eds. ), Nursing Diagnosis Handbook: An Evidence-Based Guide to Planning Care, 12th edition. St. Louis, Mosby Elsevier. Johnson, R.A. & Bibbo, J. (2016). Human animal interaction in the aging boom. In A. Fine (Ed. ), Handbook on Animal Assisted Therapy: Theoretical Foundations and Guidelines for Practice. Ch. 15, New York: Elsevier. Johnson, R.A. & Bibbo, J. (2015). Relocation stress syndrome. In B. Ackley, G. Ladwig (Eds. ), Nursing Diagnosis Handbook: An Evidence-Based Guide to Planning Care, 11th edition. St. Louise, Mosby Elsevier. Johnson, R.A. (2013). Relocation stress syndrome. In B. Ackley, G. Ladwig (eds. ), Nursing Diagnosis Handbook: An Evidence-Based Guide to Planning Care, 10th edition. (pp.647-651). St. Louis, Mosby Elsevier. Johnson, R. A., & McCulloch, W. F. (2013). Human animal bond. In G. Dvorak, & J. Roth (Eds.) Zoonoses: Protecting People and Their Pets. Ames, IA: Iowa State University Press. Johnson, R. A. & McKenney, C. (2011). Walk a hound, lose a pound: A community dog walking program for families. In R. A. Johnson, A. M. Beck & S. McCune (Eds.) The health benefits of dog-walking for people and pets. (pp. 89-104). West Lafayette, IN: Purdue University Press. Johnson, R. A. (2011). Human Animal Interaction and Animal Assisted Therapy. In R. Davis (Ed. ), Caring for family pets: Choosing and keeping our companion animals healthy. Ch 3, New York: Praeger Publishers, an imprint of ABC-CLIO. Johnson, R. A. (2010) Relocation stress syndrome. In B. Ackley, G. Ladwig (Eds. ), Nursing Diagnosis Handbook: An Evidence-Based Guide to Planning Care, 9th edition. (pp.690-695). St. Louis, Mosby. Johnson, R. A. (2010). Animal assisted interventions in human healthcare. In P. McCardle (Ed. ), How Animals Affect Us: Examining the Influence of Human-Animal Interaction on Child Development and Human Health. Ch 9. American Psychological Association. Baun, M. M., & Johnson, R. A. (2010). Human animal interaction and successful aging. In A. Fine (Ed. ), Handbook of Animal Assisted Therapy. The Handbook on Animal Assisted Therapy: Theoretical Foundations and Guidelines for Practice. Ch 15 (pp. 283-299), New York: Academic Press. Johnson, R. A. (2010). Psychosocial & therapeutic aspects human-animal interaction. In P. Rabinowitz, & L. Conti (Eds. ), Human-animal medicine; Clinical approaches to zoonoses, toxicants, and other shared health risks. Ch. 5: 24-36, Maryland Heights, Missouri: Saunders, an imprint of Elsevier, Inc.
Johnson, R. A. (2009). Relocation stress syndrome. In M. Maas, J. Specht, D. Schoenfelder, & P. Mobily (Eds.). Nursing care of older adults: Diagnoses, outcomes & interventions. Ch. 41, New York: Delmar Cengage Learning. Baun, M. M., Johnson, R. A., & McCabe, B.W. (2007). Human animal interaction and successful aging. In A. Fine (Ed. ), Handbook of Animal Assisted Therapy. The Handbook on Animal Assisted Therapy: Theoretical Foundations and Guidelines for Practice. Ch 14:285-300, New York: Academic Press. Johnson, R.A. (2006). Relocation stress. In M. Mezey, M. Bottrell, B. Berkman, C. Callahan, T. Fulmer, E. Mitty, G. Paveza, E. Siegler, & N. Strumpf. (Eds. ), The Encyclopedia of Elder Care: The Comprehensive Resource on Geriatric and Social Care. New York: Springer Publishing Company. Chapter revision for new edition. Curl, A.L., Bibblo, J., & Johnson, R.A. (2016). Dog walking, the human-animal bond and older adults’ physical health. The Gerontologist. Doi:10.1093/geront/gnw051. Sahrmann, J., Niedbalski, A., Bradshaw, L., Johnson, R., and Deem, S. (2016). Human health benefits associated with a touch tank experience at a zoological institution. Zoo Biology, 35, 4-13. Holt, S., Johnson, R.A., Yaglom, H.D., & Brennan, C. (2016). Animal assisted activity with older adult retirement facility residents: The PAWSitive Visits program. Activities, Adaptation & Aging, 39(4), 267-279. Johnson, R. & Bibbo, J. (2014). Relocation decisions and constructing the meaning of home: A phenomenological study of the transition into a nursing home. Journal of Aging Studies, 30, 56-63. Smarr, K.L., Musser, D.R., Shigaki, C.L., Johnson, R. A., Hanson, K.D., & Chokkalingam, S. (2011). Online self-management in rheumatoid arthritis: a patient-centered model application. Telemedicine & e-Health, 17(2), 104-110. Johnson, R. A., Radina, M., & Popejoy, L. (2010). Older adults’participation in nursing home placement decisions.Clinical Nursing Research, 19(4), 358-375. doi: 10.1177/1054773810372990. Johnson, R. A., & Meadows, R. L. (2010). Dog-Walking: Motivation for adherence to a walking program. Clinical Nursing Research. 19(4), 387-402. doi: 10.1177/1054773810373122Johnson, R. A.
Johnson, R. A., Rantz, M. J., McKenney, C. A., & Cline, K. M. (2008). TigerPlace: Training veterinarians about animal companionship for the elderly. Journal of Veterinary Medical Education. 35(4), 511-513. McKenney, C., & Johnson, R. (2008). Unleash the healing power of pet therapy. American Nurse Today, 3(5), 29-31. Shigaki C. L., Smarr K. L., Gong Y., Donovan Hanson K., Siva C., Johnson R.A., Ge B., Musser D. R. (2008). Social Interactions in an Online Self-management Program for Rheumatoid Arthritis. Chronic Illness, 4, 239–246. Rantz, M., Porter, R., Chesier, D., Otto, D., Servey, C., Johnson, R., Aud, M., Skubic, M. Tyrer, H., He, Z., Demiris, G., Alexander, G., & Taylor, G. (2008). TigerPlace, a state-academic-private project to revolutionize traditional long-term care. Journal of Housing for the Elderly, 22(1/2), 66-85. Johnson, R. A. & Gayer, A. (2008). Puppy love for older adults. Journal of Gerontological Nursing, 34(1), 52-53. Johnson, R. A., Meadows, R., Haubner, J., & Sevedge, K. (2008). Animal assisted activity with cancer patients: Effects on mood, fatigue, self-perceived health and sense of coherence. Oncology Nursing Forum, 35(2), 225-232. Smarr, K.L., Siva, C., Johnson, R.A., Donovan Hanson, K., Musser, D.R., Hewett, J.E., Ge, B., Parker, J.C. (2007). Online self-management program in rheumatoid arthritis: RAHelp.org 3-month analysis. Arthritis and Rheumatism, 56(9 Supplement), S308. Harnirattisai, T., Johnson, R.A. and Kawinwonggowit, V. (2006). Evaluating functional activity in older Thai adults.Rehabilitation Nursing, 32(3), 126-130. Rantz, M.J., Marek, K.D., Aud, M.A., Johnson, R., Otto, D. and Porter, R. (2005). TigerPlace: A new future for older adults. Journal of Nursing Care Quality, 20(1), 1-4. Harnirattisai, T. and Johnson, R.A. (2005). Effectiveness of a behavioral change intervention in Thai elders after knee replacement. Nursing Research, 54(2), 2-12. Johnson, R.A. (Guest Ed.). (2003). The human-animal bond. American Behavioral Scientist 4(1), 5-102. Johnson, R.A., Meadows, R. L., Haubner, J.S. and Sevedge, K. (2003). Human-animal interaction: A complementary/alternative medical intervention (CAM) for cancer patients. American Behavioral Scientist, 47(1), 55-69. Johnson, R.A. (Guest Ed.). (2003). Human-animal interaction, illness prevention, & wellness promotion. American Behavioral Scientist, 4(1), 5-6. Johnson, R.A. (2002). Commentary: Human-animal interaction research as an area of inquiry in nursing. Western Journal of Nursing Research, 24(6), 713-715. Johnson, R.A. (Special Issue Guest Ed.) (2002). Human-Animal Interaction Research. Western Journal of Nursing Research, 24(6). University of Missouri Excellence in Education Award. May, 2014. Inducted, Fellow & Distinguished Scholar, National Academics of Practice – Veterinary Medicine. April, 2013.